This story was produced by Rachel Cramer, a reporter from Crossing the Divide, a cross-country reporting road trip from WGBH and The GroundTruth Project. The team is exploring issues that divide us and stories that unite us. In early October, a group of volunteers took down a greenhouse at Big River Farms near the town of Scandia. The 150-acre incubator farm, a 45-minute drive northeast of Minneapolis, offers hands-on farmer education, land and equipment for immigrants and people of color. The growing season was winding down, but Naima Dhore's quarter-acre plot was still a colorful display of Swiss chard, curly kale and carrots. Her two sons ran around in their rubber rain boots, jumping in puddles, while Dhore washed the mud off a carrot for them. "My husband works a lot, so trying to juggle between my children and my work and here, it's a lot. But I'm passionate about farming, I love it, and it's a beautiful place here," Dhore said. In Somalia, Dhore grew fruits and vegetables in a small home garden. When the civil war broke out, she said, left with her family and eventually resettled in Minnesota. Through a mix of donors and private and federal grants, the program has grown over the last 10 years. It includes a certified organic incubator farm that leases land to farmers and offers classes, business and marketing assistance. Participants can sell produce through a farm share or CSA — community-supported agriculture — in which customers pay before the season starts, and then receive regular shares of the harvest. The growers also have the option of selling their produce at farmers markets or wholesale, either on their own or through Big River Farms. "Right now I've been getting a lot of interest from the Somali community. I think in the large part because of Naima. She's a good spokesperson," said Laura Hedeen, Big River Farms' program manager. The classes, land, equipment and seeds can add up to $700 or more during a farmer's first year — and that doesn't include the cost of gas. While some participants are able to break even by selling their produce, the up-front costs and time commitment can be prohibitive for some. Still, this year, a third of Big River's 17 farmers are Somali-American. Participants bring a variety of goals to the program. Some want to get into farming to become full-time growers. Some hope to grow food for their families. Others generate income by selling their produce some money on the side. 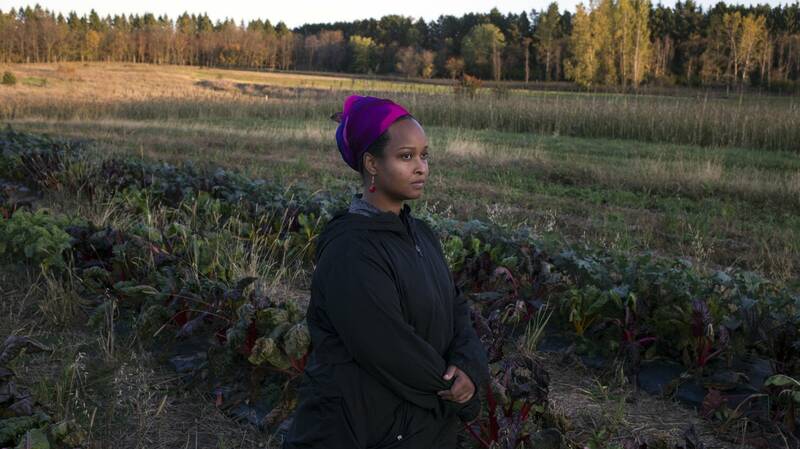 For Naima Dhore, farming is a commitment to the Somali community. "My goal and my focus for next year is to continue farming and doing education programs where I could support the community to have access to healthy food — and, more importantly, organic food," she said. But doing that while also holding down a separate job means that Dhore does most of her farming at dawn, dusk or on the weekends. "I actually had my dad come out here one night, and I had to harvest to sell at the farmers' market the following day, and it was getting really dark. He said, 'You're just crazy. I can't believe you're out here doing this alone,'" Dhore said. "But he gets it." Correction (Oct. 29, 2017): An earlier version of this story and the story audio incorrectly characterized how Naima Dhore learned about Big River Farms. The story has been updated. The GroundTruth Project is a nonprofit media organization dedicated to supporting a new generation of journalists and to adding increased knowledge and understanding on critical global issues through our enterprise journalism.